Priscila Feliciano de Oliveira1, Oscar Felipe Falcão Raposo2, Any Caroline Aragão dos Santos3, Luana Araujo dos Santos4. occupational noise, health worker services, hearing tests. Introduction: The noise is a harmful agent to the hearing, being frequent in urban and work environments. Among the structures of the hearing system, the outer hair cells are the first to be injured, and otoacoustic emissions identify minimal cochlear alterations. Objective: Analyze cochlear alterations with otoacoustic emissions transient evoked in individuals exposed to combined risk: noise and chemical products. Method: 49 workers of a cement company participated of the research, aged between 19 and 49 years old, exposure time of at least two years and normal hearing thresholds. Was performed an anamnesis and otoacoustic emissions before and post work activity. The results of the exam were related with the variable: time of exposure to the noise, age, exposure to chemical products and sound habits. The statistical tests used were: T of Student, chi-squared Pearson test and Fisher's exact test and is characterized by a prospective clinical study. Results: At the first testing, had presence of emissions in all of the workers. The average of amplitude is of 10,22 dBSPL in the right ear and 9,48 dBSPL in the left ear. In the second testing there were a variation of 0,69 dBSPL in the lef ear and 0,42 dBSPL in the right ear, of which 79,6% of individuals had presence of emission bilaterally and 20,4% absence in at least one ear. Analyzing the relation between variations of emissions with the variable was not observed statistically significant data. Conclusion: The otoacoustic emissions in the workers health search to prevent the damage to the hearing system through cochlear changings. Long ago, the noise is considered a harmful agent to human health, which is increasingly common in both urban environments and on work activities. It is known that hearing loss caused by occupational noise are irreversible, such as the noise-induced hearing loss (NIHL). NIHL is a gradual decrease in hearing due to exposure to high sound pressure level. It is an irreversible pathology, and predominantly cochlear sensorineural. Gradually develops more quickly in a period of 6 to 10 years. After that time its progress becomes slower, tending to stabilize. The frequencies most affected are acute, and if exposure is eliminated, the progression of hearing loss also ceases (1). In addition to implications of hearing, NIHL also cause extra hearing, as well as psychosocial changes characterized by isolation, stress, sleeping difficulty, decreased self-esteem, depression, as well as neurological disorders, vestibular, digestive, cardiovascular and hormonal (2) . Therefore, early intervention in workers exposed to noise. One way of preventive action is the audiometric monitoring that can be done by hearing evaluation (pure tone audiometry, speech and impedance). In addition to these basic tests, with the advent of otoacoustic emissions (OAE) is it possible to identify injuries even before the hearing loss to be installed. The application of the EOA, which is an objective test, it also serves to aid in the differential diagnosis of sensorineural hearing loss, and allows the identification of minimal functional changes in the auditory system. OAE responses are specific frequencies at which hair cells (OHC) are normal or near normal, which allows to investigate simultaneously different parts of the cochlea (3). Thus, it is believed that the present otoacoustic emissions may be related to the integrity of the OHC (4). In patients exposed to high sound pressure level, the OAE may be affected even before the appearance of subjective symptoms and signs of audiometric, showing the aggression of the OHC, a fact that reveals the EOA as an important complementary test (5.6). Thinking about these aspects, was carried out a study of 30 subjects, with normal hearing thresholds in the business of weaving. All workers were using ear protection and were exposed to noise that alternated between 80 and 90 dB SPL. The methodology comprised pure tone audiometry and transient evoked otoacoustic emissions (TEOAE) in a soundproof booth, before and after exposure to high sound pressure level for 5 hours. In the analysis of TEOAE results. There was a significant decrease in reproducibility in all frequencies in right and left ear after noise exposure (5). In order to check correlation between temporary hearing threshold shift, variations in the amplitude of OAE responses and susceptibility to noise-induced hearing loss has been used in research, audiometry and OAE tests. Study participants were divided into two groups of workers: one with normal hearing and another with a diagnosis of NIHL. All examinations were performed before and after exposure to a noise of 105 dB HL, for ten minutes in each ear, through headphones in a soundproof booth. In the TEOAE, the variations of the amplitude of response were less than 1 dB, and the variations by frequency band, less than 3 dB. There was no significant difference between right and left ears (7). A comparative study was performed to confirm the effectiveness of otoacoustic emissions in order to correlate the pure tone audiometry in the evaluation of cochlear from noise. We selected 32 male workers of a metal factory. Audiometry and TEOAE before and after working hours, but was not seen significant change in audiometry. As for the TEOAE showed significant reduction after exposure to noise, with the average value of 1.2 ± 1.1 dB. It was concluded that OAE are sensitive in evaluating the cochlea after noise exposure (8). A population that is exposed to high sound pressure level are the workers of the cement production, the object of our study. Besides the noise, are also exposed to another agent: the vibration, which can have a negative impact on hearing health. The concomitant exposure, noise and vibration can aggravate the effects on hearing and change the physical well-being and mental health. Thus, the objective of this study is to analyze the responses of transient evoked otoacoustic emissions in subjects exposed to occupational noise. This study was an epidemiological cross-sectional design and was approved by the Ethics Committee and approved with the number-CAAE 3601.0.000.107-10 (Annex). The sample consisted of 49 subjects with normal hearing for a company in the business of producing cement. The study included workers male and female, but most of the population studied is male, since it is almost the total population that acts in the segment. Workers who participated in the study were exposed to a noise level above 85 dB SPL and were using ear protection. Also had a history of occupational noise exposure of at least two years on a journey of 8 hours daily. The audiometric tests were provided by the health service and the company we selected, only the audiograms showed that thresholds compatible with the normal range in both ears. The examinations were performed on a single service for a speech therapist, always with the same audiometer. After the selection of subjects at random, they were asked to fill out a medical history that was developed by the researchers. The clinical history had the purpose of obtaining information about the time of exposure to noise, use of hearing protection, tinnitus and information about health in general. Next was the examination of TEOAE before the work day with a sound rest of 14 hours. The testing was performed in the company within a soundproof booth, which followed the standards of ANSI. This fact ensured that the background noise does not interfere with testing. The equipment was a manual EOAE OTOPORT LITE, OPL serial number 09101991, manufactured by Otodynamics LTD. As a parameter, the TEOAE equipment in question, produces non-linear click as a stimulus presented at an intensity of 84 dB PK to assess the half-octave bands centered on frequencies 1.0, 1.5, 2.0, 3, 0 and 4 kHz. 260 clicks were used with a maximum testing time of 300 seconds. The criteria used are based on the configuration parameters contained in the equipment manual of the manufacturer's . In a third step of the research was conducted repeated TEOAE after working 8 hours daily. The testing was conducted in a single day, and the post-TEOAE journey performed within 15 minutes after the close of working activity. The worker was asked to return the room that held the first test, after the working day for the second day of testing with TEOAEs. The classification and interpretation of results were made in accordance with worsening, improvement or maintenance of TEOAE amplitude, comparing tests performed before and after exposure to noise. After completion of the evaluation was created a database with the Statistical Package for the Social Sciences (SPSS, version 17.0) for statistical analysis. To characterize the population was used descriptive statistics (mean, median, standard deviation, maximum and minimum) and to assess the relationship between the independent variables (age, exposure to chemicals, and exposure time to noise, sound habits and tinnitus) was performed Student t tests, chi-squared Pearson tests and Fisher's Exact test. Were considered statistically significant p values less than or equal to 0.05. The workers had an average age of 31.2 years and exposure to occupational noise ranged from 02 to 28 years, and 42.85% of workers were exposed to high sound pressure level for a period of 02 to 05 years. With respect to the chemical, only 13 reported exposure to some agent and 30 workers reported not performing any activity that involves exposure to high sound pressure level. As to tinnitus, 44 (89.8%) workers did not complain and only five (10.2%) reported it, and this type of whistle or hiss. 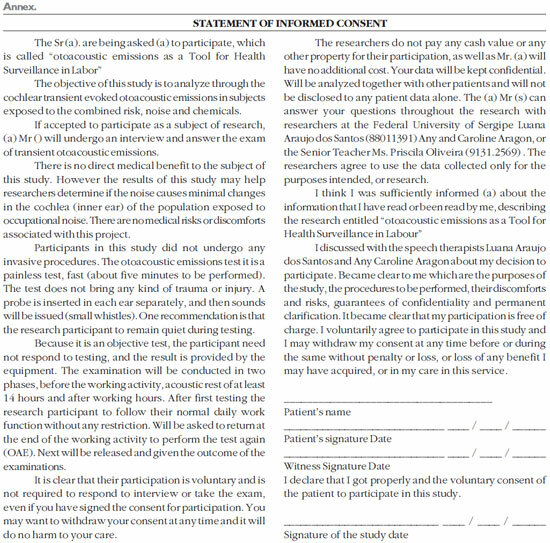 As to the evaluation of TEOAE, all workers in the first presence of TEOAE testing, which is characterized, as described in Table 1. In the second test, among the 49 workers involved in the study, 09 of them had absence of TEOAE in the right ear and five in the left ear, as can be seen in Table 2. Considering the average amplitude of the right ear of 10.22 dB in the first test and 9.80 dB in the second test, it is possible to observe greater variation in the overall amplitude in the left ear as shown in Table 3. Correlating the dependent variable (TEOAE) with the independent did not observe statistically significant values. 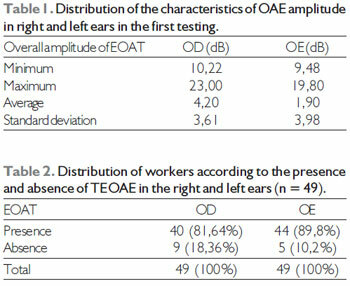 As described in the results, the population surveyed was submitted to the achievement of otoacoustic emissions in two stages; first testing it on 100% of the workers had a presence of TEOAE. In contrast, the literature reports that there are cases of lack of response to TEOAE even in individuals with normal hearing thresholds (5, 6, 7, 8, 9, 10,11). In the first test, before the workday, the result of overall TEOAE response levels, the right ear was 23 dB [AC1] of 4.2 dB maximum amplitude and minimal. In the left ear, the maximum amplitude was 19.80 dB and a minimum of 1.90 dB which showed greater maximum amplitude in the right ear. These data corroborate studies that also reported increased amplitude in the right ear (6.10). This can be described by believing that the spontaneous OAE may influence the responses of TEOAEs in the right ear, as though it is usually bilateral, presenting himself unilaterally, are more frequent in the right ear as shown in other studies (12,13). It is noteworthy that the overall average of the amplitudes of the right ear (10.22 dB) and left (9.48 dB) showed no statistically significant difference could also be observed in several studies (5, 7, 11, 14, 15). When comparing the responses of TEOAE, the first and second testing found a prevalence of larger amplitudes of TEOAE responses before the workday, and in the right ear, 97.5% responded better in the first test, and the left ear were 88.6%. Thus the overall amplitude was often better in the first test and worse in the second test after exposure to noise, but can also be observed in the literature (5, 6, 7, 8, 9, 10, 11). In TEOAE analysis showed that 40% did not have bilateral and unilateral 60%. On the other hand found no Fiorini predominantly bilateral in 48.7% of cases and only 20% of unilateral absence (11). Of those who showed no response in at least one ear, nine (18.36%) failed in the right ear and five (10.2%) in the left ear after noise exposure. Fiorini also reported a higher prevalence of absence of TEOAE to the right ear in noise-exposed workers (11), however, Souza found a major gap in the left ear TEOAE (6). With regard to the cochlear reproducibility, we analyzed the variation of the average overall amplitude between the first and second test, with 0.42 dB to 0.69 dB right ear and left ear. This fact can also be observed in a study in which researchers found variations in the overall response amplitudes with values less than 1 dB (7). However, the literature showed that there was significant reduction in TEOAE level after exposure to noise, with values greater than 1 dB (8). Another study reported values above 1.7 dB (5). Of all the workers who showed no response in at least one ear, none of them mentioned the difficulty in hearing. This suggests that even after the noise exposure, the workers did not show noticeable symptoms hearing. In literature, it was observed that the absence of TEOAE suggests initial injury of outer hair cells, so the symptom is often noticeable, but already shows changes of the basilar membrane and this can be identified early through the TEOAE (16) . The 10 workers who had no response in at least one ear had a mean age of 35.3 years and duration of noise exposure of 7.8 years. However, there was no statistically significant difference between exposure time, age, exposure to chemical and no emissions. Of the 49 workers surveyed, only five (10.2%) reported tinnitus, and there was no statistically significant difference between tinnitus and no emissions. In contrast, in the literature, there is a high prevalence of tinnitus in the population exposed to occupational noise (17, 18). -There were better answers before the occupational activity: the right ear in 97.5% and 88.6% in the left ear. -Both the first and second testing the right ear had an higher maximum amplitude in the left ear. -20.4% of workers presented TEOAE absent in at least one ear. Of these, 100% used hearing protection in companies before and currently use, 50% work with chemicals, only 10% practice extra-occupational activity with high sound pressure level and none of them reported difficulty in hearing. Given the findings obtained showed that the TEOAE test in fact is an instrument that enables the monitoring of changes in OHC function, even in individuals with hearing thresholds within normal limits. However the analysis of the results showed that there was no statistically significant data regarding these criteria: age, exposure time, exposure to chemicals and non-occupational activity with high sound pressure level. 1. Brasil. Ministério da Saúde, Secretaria de atenção à saúde, Departamento de ações programáticas estratégicas. Protocolo de complexidade diferenciada: Perda auditiva induzida por ruído. 1ª ed. Brasília: Editora do ministério da Saúde, 2006. 40p. Disponível em 19 de Out. 2010. 2. Seligman J. Sinais e sintomas na PAIR. In NudelmanN AA, Costa EA, Seligman J, Ibañez RN. PAIR- Perda Auditiva Induzida pelo Ruído. Vol.I, Porto Alegre: Bagaggem Comunicação, 1997. p. 143-151. 3. Sousa LCA, Piza MRT, Alavarenga KF, Coser PL. Emissões Otoacústicas. Eletrofisiologia da Audição e Emissões Otoacústicas: Princípios e Aplicações Clínicas. São Paulo: Tecmedd; 2008, p. 109-30. 4. Lewis DR. Emissões Otoacústicas: Aplicações clínicas. In Ferreira R.P., Befi-lopes DM, Limongi SCO. Tratado de fonoaudiologia. São Paulo: Roca; 2004. p. 617-629. 5. Barros SMS, Frota S, Atherino CCT, Osterne F. A eficiência das emissões otoacústicas transientes e audiometria tonal na detecção de mudanças temporárias nos limiares auditivos após exposição a níveis elevados de pressão sonora. Rev Bras Otorrinolaringol. 2007, 73(5):592-8. 6. Souza DV. Estudo comporativo das Emissões Otoacústicas em militares expostos e não expostos ao ruído. 2009. 170 f. Dissertação de Mestrado (Mestrado em fonoaudiologia) - Universidade Veiga de Almeida, Rio de Janeiro, 2009. 7. Negrão MA, Soares E. Variações nas amplitudes de respostas das emissões otoacústicas evocadas e suscetibilidade à perda auditiva induzida por ruído - PAIR. Rev Cefac. 2004, 6(4):414-22. 8. Sliwinska-kowalska M, Kotylo P, Hendler B. Comparando-se as alterações transitórias, em Emissões Otoacústicas e audiometria tonal liminar, após a exposição ao ruído industrial curto. Vol 1, Ed.2. Lodz, Polônia: Noise & Health, p. 50-57, 1999. 9. Marques FP, Costa EA. Exposição ao ruído ocupacional: alterações no exame de emissões otoacústicas. Rev Bras Otorrinolaringol. 2006, 72(3):362-6. 10. Mor R, Frasson MA. Emissões otoacústicas e sistema olivococlear medial: pacientes com zumbido sem perda auditiva. Rev Pró-fono. Barueri. 2005, 17(3). 11. Fiorini AC, Fischer FM. Expostos e não expostos a Ruído Ocupacional: Estudo dos Hábitos sonoros, Entalhe Audiométrico e Teste de Emissões Otoacusticas Evocadas por estimulo transiente. Rev. Distúrbios da Comunicação. São Paulo, vol. 16, n. 3, p. 371-383, Dez 2004. 12. Azevedo MF. Emissões Otoacústicas. In: Figueiredo MS. Conhecimentos essenciais para conhecer bem emissões e bera. São José dos Campos: Pulso; p. 35-75. 2003. 13. Nodarse EM. Empleo de las emisiones otoacusticas para el pesquisaje del deficit auditivo. Rev Habanera Cienc Méd. 2006, 5(1). 14. Konopka W, Pawlaczyk-Luszczynska M, Sliwinska-Kowalska M, Grzanka A, Zalewski P. Effects of impulse noise on transiently evoked otoacousticemission in soldiers. Int J Audiol. 2005, 44(1):3-7. 15. Olszewski J, MiBoDski J, Olszewski S, Majak J. et al. Hearing threshold shift measured by otoacoustic emissions alter shooting noise exposure in soldiers using hearing protectors. Otolaryngology -head and Neck Surgery. 2007, 136(1):78-81. 16. Jerger S, Jerger J. Alterações Auditivas: Um Manual para Avaliação Clínica. Rio de Janeiro, Livraria Atheneu Editora, 1989. 17. Dias A, Cordeiro R. Interação entre grau de perda auditiva e o incômodo com zumbidos em trabalhadores com história de exposição ao ruído. Rev Bras de Otorrinolaringol. 2008, 74(6):876-8. 18. Possani LNA. Estudo da Prevalência e das características do zumbido em trabalhadores expostos ao ruído. 2006. 109 f. Dissertação (Mestrado em Epidemiologia)- Universidade Federal do Rio Grande do Sul- UFRGS, Porto Alegre. 1) Master in Speech PUC SP. Assistant Professor, Center for Speech, Federal University of Sergipe. 2) Master of Applied Statistics and Biometry by UFRPE. Assistant Professor, Department of Statistics and Actuarial Science, Federal University of Sergipe. 3) Graduation Speech by Federal University of Audiology. Speech unattended. 4) Graduation Speech by Federal University of Sergipe. Speech unattended. Article received in 2011 March 19th. Article approved in 2011 August 14th.